This afternoon, the LIGO Scientific Collaboration and Virgo Collaboration announced the fourth significant detection of gravitational waves. This event, dubbed GW170814, originated from the inspiral and collision of two black holes, located more than a billion light years away. The two black holes had estimated masses of 31 and 25 solar masses, with roughly 3 solar masses’ worth of energy emitted leading up to the collision, similar to those binaries seen previously through gravitational waves. Researchers at CITA who are members of the LIGO Scientific Collaboration played an important role in this milestone. 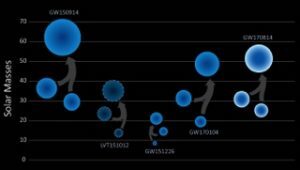 In particular, CITA researchers helped lead the effort to analyse GW170814 and characterize the binary, providing the best estimates for the masses and spins of the black holes and the location of the merger in the sky. CITA researchers also assist in cross-checking gravitational wave signals like GW170814 against supercomputer simulations of black hole mergers, and in developing the rapid search techniques that first identified the gravitational wave signal. An example simulation of the merger of two black holes with masses consistent with GW170814 is seen below*. More information about CITA’s involvement in LIGO and gravitational waves can be found on our research page. *: An animation showing GW170814 the first triple-coincident observation of a black hole merger by the LIGO and Virgo detectors. LIGO documents with link to public access.